New York City Labor Against the War (NYCLAW) salutes the ILWU’s Pacific Coast May Day Shutdown to Stop the War in Iraq and Afghanistan. From the beginning, Bush & Co. have sought to justify this war for oil and empire with phony claims about “fighting terrorism,” finding”weapons of mass destruction,” and spreading “democracy.” Despite overwhelming rejection of its policies at the polls, the administration has steadily escalated its war in the Middle East. This has meant not only ordering thousands more troops to Iraq and Afghanistan, but also arming and financing Israel’s war on Lebanon and its increasingly brutal slow-genocide of the Palestinians, launching a proxy invasion of Somalia, bombing Pakistan, and threatening to attack Iran. As in all such wars, ordinary working people pay the price. In Iraq and Afghanistan, this war has killed more than a million people, caused more than 50,000 G.I. casualties, promoted civil war, cost at least $1.2 trillion and pushed the economy into crisis — with no end in sight. At home, the administration continues to attack civil liberties, the Arab-Muslim community, undocumented immigrants, Katrina refugees, people of color and labor. Yet this is a bipartisan war. Congressional Democrats — including senators Clinton and Obama — have given Bush every penny he has asked for. They have refused to filibuster war spending (which requires only 41 Senate votes) and won’t even promise to get out by the end of the next presidential term in 2013. At most, they call for “redeployment” to maintain U.S. control of the region. It will take a similar mutiny to end this war. The ILWU has a proud tradition of work stoppages to protest South African apartheid and U.S. death squads in Central America. Your May Day action shows how workers — both in and out of uniform — have the collective power to end this war, bring the troops home now, and get the U.S. out of the Middle East. Re: “Lisa Schreibersdorf Receives Public Defense Award” by Elizabeth Stull; published Feb. 5, 2008 and Brooklyn Attorney Leads State Association Of Criminal Defense Lawyers” by Elizabeth Stull; published Feb. 13, 2008. Legal Aid Union Members Protest NYSBA Defense Award to Lisa Schreibersdorf. The undersigned 100 union members at The Legal Aid Society protest the New York State Bar Association’s selection of Lisa Schreibersdorf to receive the Michele S. Maxian Award for Outstanding Public Defense Practitioner. Maxian, who died in 2006, was a Legal Aid Society attorney who selflessly dedicated her career to strengthening and improving indigent criminal defense. Because of her efforts, the NYPD was ordered to arraign criminal defendants within 24 hours of arrest. She frequently testified in support of criminal justice reform. And she tenaciously defended the Society against Rudolph Giuliani, who slashed Legal Aid funding in retaliation for a 1994 strike by the Society’s attorneys (Association of Legal Aid Attorneys/UAW Local 2325) and support staff (1199SEIU). Yes, Schreibersdorf too once worked at The Legal Aid Society. Unlike Maxian, however, Schreibersdorf and several other of our former colleagues responded to Giuliani’s attack by setting up a nonunion contractor, Brooklyn Defender Services (BDS), which successfully bid for millions of dollars cut from the unionized Society. In this, she was joined by Appellate Advocates (Second Department), Bronx Defenders, Center for Appellate Litigation (First Department), Queens Law Associates, New York County Defenders Association, and Battiste, Aronowsky & Suchow (Staten Island). While management at the nonunion contractors has profited, Legal Aid staff and clients have paid the price: deep personnel cuts, sharply-escalating workloads and near-institutional bankruptcy. As the New York Times reported in 2001, Giuliani’s cuts — which by then totaled a cumulative $160 million — had “hobbled” the Society. In 2006, a report to Chief Judge Judith Kaye reiterated that finding, and concluded that Giuliani’s competitive bidding policy had predictably fragmented and weakened the entire indigent defense system in New York City. It also reported declining conditions for line staff at the nonunion contractors. Rather than take any responsibility for helping to bring this about, Schreibersdorf disparages her former colleagues: “I left Legal Aid in the mid nineties. In my opinion, it’s not the same place it was.” In 2008, Schreibersdorf has added insult to injury by shamelessly trading on her past connection with the Society. But the honor belongs to Legal Aid staff, who — despite these continuing attacks — have sought to defend the quality of indigent representation that Schreibersdorf and her confederates have helped to undermine. Please forward this letter to all NYSBA officials. 1. Affirm. of Lisa Schreibersdorf (July 16, 1996), Legal Aid Society v. NYC, No. 603291-96 (Sup Ct., NY Co.). 2. Goldstein, 12 Bidders Seek to displace Legal Aid; Proposals to be Screened By City Agency by Jan. 17, NYLJ, January 9, 1996. 3. Fritsch & Rohde, For New York City’s Poor, a Lawyer With 1,600 Clients, N.Y. Times, April 9, 2001. 4. Status of Indigent Defense in New York: A Study for Chief Judge Kaye’s Commission on the Future of Indigent Defense Services, Final Report (The Spangenberg Group, June 16, 2006), at 154. 5. In the Matter of the New York State Commission on the Future of Indigent Defense Services (May 12, 2005), at 198. 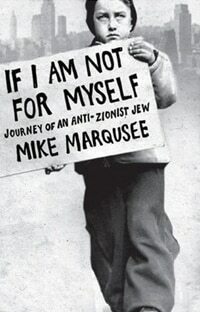 Your book is subtitled “Journey of an Anti-Zionist Jew.” Were you always an Anti-Zionist? No. I grew up, in the 1960s, in a left-wing household in a largely Jewish New York suburb — where Israel was seen as a progressive beacon and support for the Jewish state was taken for granted. My parents combined activism in the civil rights and anti-war movement with blind devotion to the Israeli cause. I attended a Reform Sunday school in which Israel played a much more important role than God or the Hebrew Bible. When Israel won the Six Day war, I felt the same triumphant glow as everyone else in my community. The contradictions I came to feel between my anti-racist and anti-war views and what Israel was doing. It was a prolonged process, pushed along by two factors. First, events in the Middle East and the increasingly obvious injustice of Israeli policy towards the Palestinians. Second, the stubborn and repeated re-emergence of Palestinian struggle, without which, we wouldn’t be talking about the issue at all. Why did you chose to make your grandfather a central focus of the book? After my mother died in 2001, I inherited a box stuffed with my grandfather’s papers: diaries, letters, campaign literature and hundreds of columns written for a Bronx newspaper called the Jewish Review, from the 30s to the early 50s. He spent several decades as a political activist — pro-labor, pro-civil liberties, anti-racist and anti-fascist. He got involved in the Scottsboro campaign and chaired the Bronx branch of the Committee to Aid Republican Spain. He joined in the street confrontations against the anti-Semitic Christian Front and fiercely criticized the passivity of the Jewish establishment. Though he worked with Communists, and loathed red-bating, he was never a member of the party and had no patience with what he considered to be party-line regimentation. In 1946 he ran for Congress on the American Labor Party ticket and secured 20% of the vote. Fascism and anti-Semitism turned him into a militant Jew (he was actually half Irish), but he only became interested in Zionism from about 1940 — when he interviewed Jabotinsky (and criticized him for making a war-time alliance with the British). In 1948, he filled the pages of the Jewish Review with his glee at Israeli independence (“the Bar Mitzvah of our people”) and his outrage at the British and the Arabs. He had always seen himself as an anti-imperialist, he hated the British Empire and saw the Arabs as savage pawns of the British. All his worst traits come to the fore. His tone is militaristic and chauvinist and at times bloodthirsty. The man who had been a stand-up champion of refugee rights since he’d opposed the Quotas Act of 1924 was now, in 1948, almost gloating over the Palestinian exodus. One of the questions my book sets out to answer is how that transition came about. Partly, it’s an object lesson in the perversities of the politics of identity. But my grandfather wasn’t alone. The Western Left overwhelmingly supported the Jewish state. In the presidential campaign of 48, Henry Wallace constantly attacked Truman’s alleged betrayal of the Jews in Palestine, which he, and much of the Left, viewed as part of Truman’s Cold War, anti-Soviet, pro-British policy turn. In my grandfather’s papers, I found echoes of current controversies and of my own experiences as a political activist. For me it was an intriguing example of life on the Left, in a particular time and place, and how activists, like everyone else, are driven both by inner demons and larger forces. Some on the Left limit their criticism of Israel to the occupation of additional Palestinian territory since 1967. Is that the extent of the problem? No. The Palestinian refugee population — descendants of those driven out in 1948 — now numbers at least 5 million, one half of whom live in Jordan, Syria, and Lebanon. One million remain stateless, with no form of identification other than a UNWRA cards. The end of the occupation would strengthen them in various ways, but in itself would not rectify their situation or meet their demands for justice. In addition there are 1.4 million non-Jews in Israel, who suffer institutionalised discrimination and segregation and are confined to second-class citizenship. These two groups of people — the refugees and Palestinians within Israel — are not just additional problems that can be addressed separately. They are part of the wider and deeper problem created by the Zionist state. At this point in history, it’s clear that the Zionist mission has an in-built exclusivist and expansionist dynamic. Maintaining a Jewish state requires maintaining a sizeable majority Jewish population with an ideological commitment to the state. Palestinian demands — and actually existing Palestinians — stand in the way of that. Zionism is an obstacle not only to the realisation of a single democratic state in Palestine but immediately to any acceptance of genuine self-determination in any form for the Palestinians. Why do Palestinians refuse to “recognize the Jewish state,” and insist on the right of return for refugees from the Nakba in 1948? The Palestinians’ right of return is guaranteed in Resolution 194 which has been reaffirmed by the UN many times since 1948. It embodies a basic and widely recognised principle, without which, there would be no protection for victims of wars, and ethnic cleansing would be legitimised. To abandon the right of return is to abandon several million people, and to exempt Israel from the requirements we make of other states. It’s not an impossible utopian demand, either. It’s something that could be practically implemented through negotiations, though it would of course require major concessions from the Israeli side. While Israel refuses to recognise its responsibility for the refugees and their descendants, it demands that these very people recognise its own “right to exist”. It’s an extraordinary demand. No one denies the fact of Israel’s existence, but why should anyone anywhere be compelled to recognise the “right to exist” of a particular state formation? What’s being demanded here is an ideological seal of approval: support for the right of the Jewish state to exist, in perpetuity, in Palestine, regardless of what that entails for others. Palestinians and their supporters are condemned because they refuse to certify as legitimate a national project built on dispossession and ethnic supremacy. Is there reason to hope that a greater number of Jews will reject Zionism? Yes. Israel’s record has now been so exposed that it requires huge amounts of willful blindness to continue to defend it. The facts are now too well documented, too available. Also, despite everything, there remains a leftward bent within the US and British Jewish populations. It’s a tradition that’s been profoundly eroded over the years but is still quite tangible, and it can’t be reconciled with Israel’s behavior or Zionism’s assumptions. Despite strenuous efforts to keep Jews in the corral, most Jews in the US or Britain live wider lives and their views are shaped by the same things that shape other people’s views. Like others, they find ethno-nationalism and blind chauvinism unappealing. I think the aggressive tactics of the ADL and the like have to some extent backfired — though in the meantime they’ve taken plenty of victims. As the pro-Israel establishment finds doubt spreading among the people it claims to represent, it gets more strident and vicious. One of the themes of my book is that Zionism’s hegemony within Jewish communities was the product of a particular history; it wasn’t automatic; it’s changed over time and it’s changing now. How do you evaluate the significance of growing opposition to a “two-state solution” and increasing support for one democratic state in all of historical Palestine? It springs from Israel’s refusal to countenance any meaningful form of Palestinian independence. All the “two state solutions” envisioned by Israeli leaders are aimed at perpetuating Jewish supremacy. In one sense, the argument is simple: democrats oppose ethnically-privileged states everywhere. The logic behind the demand that Israel becomes “a state for all its citizens” ought to be self-evident, yet when it was raised by Palestinian members of the Knesset, it was met with outrage and those who raised it were subject to repression. Is it conceivable that a Zionist state in the Middle East will rest at peace with its neighbours? It would certainly continue to require huge subsidies from the USA and other Western countries and would continue to tie the Jewish population of Palestine to the broader imperial project in the region. That’s a recipe for endless instability and injustice.